We are a fully licensed business, a registered NAMM member, and an authorized Jensen, Celestion, WeberVST, Tone Tubby, Kendrick, Mojo, Victoria, THD, Mercury Magnetics, Groove Tubes, JJ, Electro-Harmonix, Sovtek, Svetlana, Tung-Sol, TAD, Mullard and SED-C dealer! We carry a FULL line of speakers, transformers, NEW & NOS tubes, other Amp Accessories and Power Attenuators & Converters! With over 450+ speakers in stock and a huge selection of tested vacuum tubes, SVVA is THE largest speaker and tube dealer in Northern California! As a guitar player since 1967, playing & collecting mostly vintage tube amplifiers, I have personally owned over 50 Fender, Marshall, & Gibson tube amps. And, as a degreed engineer and 15+ year Silicon Valley electronics industry veteran, I have developed a passion for both technology and tube amplifiers! Becoming my own amp technician, servicing, repairing and restoring my own amps, just seemed like a natural progression. Within a short period of time, a few musician friends and local guitar shops began asking me to work on their amps …thus; South Valley Vintage Amps was born! Vintage tube amps provide excellent tone and reliability for the working musician, serious guitar player, collector or hobbyist. 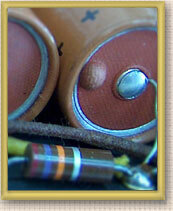 However, like any electronic system, these amps have components that over time are subject to wear and replacement. Tube amp power and preamp circuits function in a high voltage environment (typically 350V – 500V). In this environment, vacuum tubes degrade and capacitors & resistors age over time causing them to drift or fail. These worn and failed components can often change the electrical functionality and tone of the amp. The results may cause the amp to sound bad, cease functioning, smoke, or could possibly even catch fire. So, if you own a tube amp and want it to be a reliable companion in the practice room, at rehearsals or live gigs, then it should be given the regular check-up and service it deserves.